One of my favorite cookbooks is The Vegetable Dishes I can't Live Without by Mollie Katzen. I love vegetables, but sometimes need inspiration on delicious, new ways to serve them. This cookbook is chock full of inventive, delicious ways to serve up all sorts of veggies. 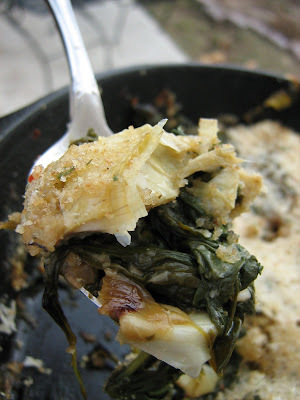 This particular dish reminds me of Spinach-Artichoke Dip, because of its ingredients, but is is fresher tasting and much healthier. The spinach is wilted with onions and garlic and then the artichokes are stirred in. Top it off with bread crumbs and some fresh Parmesan and you have a great main or side dish. Plus, I love how rustic it looked, served in a cast-iron skillet. It was easy to prepare and very delicious. If you love vegetables or need some new ways to fix them, I recommend checking out this cookbook. 2. If using frozen artichokes, run under tap water to defrost. If using canned or bottled, drain on a paper towel. 3. Rinse spinach and shake off most of the water. 4. Place a large, deep skillet with an ovenproof handle over medium heat. Heat oil and add onion. Saute for 5 minutes. 5. Increase the heat to med-high, add the spinach and cover. Cook, tossing occasionally, for 3-4 minutes, or until wilted. Remove cover and continue to cook for about 10 minutes or until the liquid released by the spinach mostly evaporates. 6. Turn the heat back to medium and add the garlic. Saute until garlic is fragrant. Stir in salt, pepper and artichoke hearts. Remove from the heat. 7. Smooth the top surface with the back of a spoon and sprinkle the bread crumbs evenly over the top, followed by an even layer of cheese. 8. Bake, uncovered, for 10-15 minutes, or until the Parmesan is golden and the bread crumbs have turned golden and crispy. Serve hot or warm. That sounds so good! I can't wait for the tilapia. I'm adding this to my future dishes to make list. Artichokes are my favorite and with spinach?? Even better! This veggie dish looks awesome! YUM! I love gratins. They are so easy and delicious. This recipe sounds great, I'll have to try it. Oh this looks great. I've been wanting to make artichokes lately...love it with the spinach!! Oh yum! Two of my favorites to cook with! I always need new veggie ideas! It looks wonderful! what a great idea! Can't wait to try this. I love this one, Mare! It sounds like it would be great with so many different things! Oh, this sounds fabulous. This will have to go on my list of things to try. This sounds fabulous and looks even better. I'll be sure to check this book out of the library!!! Thanks! have that cookbook Mary Ann, and I haven't used it yet. I clearly need to dig it out and start cooking! THis looks fabulous, but then again, everything you cook does!